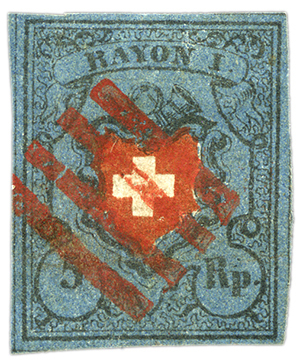 David Feldman Auctions is proud to announce that it has been entrusted with the sale of Dr. Heissinger’s Large Gold Medal collection on the first federal stamps of Switzerland – The Durheim Issues, 1850-54. The auction will be held in Geneva on the 20th of March 2019. Prior to this auction, a special viewing of the lots will be organised in Zurich to enable those who may not be able to come to Geneva to examine the lots they are interested in. This extraordinary collection, patiently built over many years, features many key items from this fascinating classic issue including a very elusive Rayon II with framed cross, a Rayon II with inverted yellow background (only 12 recorded), Orts-Post with unframed cross in strip of six (only known), superb Poste Locale with unframed cross, also essays, varieties, a wide range of cancellations and frankings including first day covers, stampless period covers (Dec. 1851), covers addressed abroad including with Orts-Post stamps, and much more.